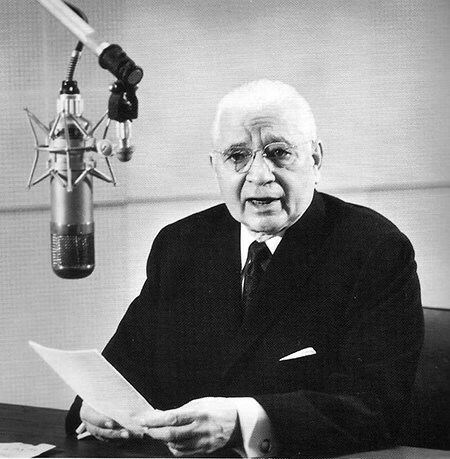 In the fall of 1933, little 100-watt KORE in Eugene, Oregon, offered local preacher Herbert W. Armstrong free use of a 15-minute spot for a morning devotional. The spot had to be shared with other ministers from other local churches, but Armstrong’s broadcasts had enough response that by the New Year he was offered a full program of his own. Never one to back away from self-promotion, the new Sunday morning show was more than a mere devotional broadcast, it was the beginnings of the Radio Church of God. The program was renamed The World Tomorrow after the 1939 World’s Fair in New York which had been themed “the World of Tomorrow”. By now, Armstrong had built quite a name for himself by naming Hitler and Mussolini the embodiments of The Beast and The False Prophet named in the Book of Revelations who were to deceive the nations for a short time before the return of the Savior. Armstrong was supremely confident in making prophecies, which was reflected in his own conversion process. He was born to a Quaker family in Des Moines, Iowa, in 1892. Growing up, he attended services and Sunday school regularly. When he was 18, he took a job in the classified advertising department of the Des Moines Daily Capital, and the abbreviated writing style of print advertising would have a large impact on his preaching style. He married a distant cousin, Loma Dillon, in 1917, and the couple moved to Chicago to find their fortune. When the fortune failed to appear with the dawn of the Great Depression, the growing family moved to Eugene to be near Loma’s parents. Herbert continued in advertising with little success in Depression-era Oregon. Loma became acquainted with members of the Church of God (Seventh Day), a group whose basic tenets included Saturday Sabbath observance. At first, Herbert dismissed her feelings as mere religious fanaticism, but Loma challenged her husband to find biblical support for Sunday observance. With little business in the advertising office, Herbert found he had a great deal of time for Bible study. He felt that his long study sessions were inspired by God. Another argument with a relative led him to expand his studies to include the theory of the Evolution of Species. He eventually determined that his wife had been correct about the Sabbath but that Evolution had no basis. Armstrong was ordained as a minister in the Oregon Conference if the Church of God (Seventh Day), although some of his peers felt he had a tendency toward arrogance and did not stick closely to Church doctrine. Sometime after The Radio Church of Christ began, he broke with the Church of God (Seventh Day) and began teaching a form of “British Israelism”, the belief that the peoples of Great Britain and the United States were direct lineal descendants of the Ten Lost Tribes of the Israelites. Donations began to pour into The World Tomorrow, and in 1946, Armstrong moved his operations to Pasadena. He maintained that his was a poor family, but he bought a house on “Millionaires Row” just off the Rose Parade route. During the 1950s, The World Tomorrow began broadcasting on Radio Luxembourg, and Armstrong published a controversial book, 1975 in Prophecy! It was Armstrong’s view that World War III would be a nuclear contest which would result in the enslavement of mankind until the glorious return of Jesus Christ who would then rule as a benevolent dictator. Loma passed away in 1967, three and a half months before the Armstrong’s 50th wedding anniversary. In 1968, The Radio Church of God was retitled as the World Wide Church of God. Son Garner Ted Armstrong was being groomed to take over as the church’s Pastor General. He had become the face and voice of The World Tomorrow on TV and Radio, but he was suspended in 1972 over an adultery scandal. In 1978, Ted was disfellowshipped over doctrinal differences with his father. At its zenith, Armstrong’s ministry had expanded to 382 TV stations in the US and 36 international television outlets, dwarfing rival televangelists Jerry Falwell, Jimmy Swaggart, Oral Roberts, and Jim Bakker. A church-based foundation was set up to encourage stamping out illiteracy, creating mobile schools in poor regions and schools for the disabled, and to conduct archeological studies of biblically significant sites. In his final days, Herbert Armstrong admitted that he did not know whether or not Christ would return during his lifetime, but he know that the Lord’s return was approaching. He spent the end of his life in his home on the campus of Ambassador College, the school he founded to train ministers for his church. He died on the morning of January 16, 1986. He was 93 years-old. 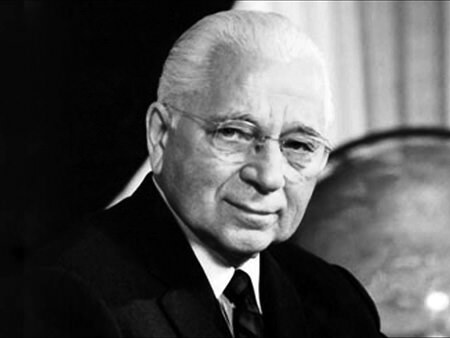 Be the first to comment on "Herbert W. Armstrong Sermons"